I come today with a simple question. What is people success rate of replacing extremely rusted rear sub frames? I mean EXTREMELY rusted. I can push a screw driver clean into the sub frame where the bolts go into the body of the car. My major concern is breaking the 4 bolts that hold it to the body of the car. Seems that any Impreza up until 2001 would work also. I dont see why the 2002-2007 impreza's would not work? I know the old sub frames have a mustache bar, the newer 2004 rear sub frames dont. 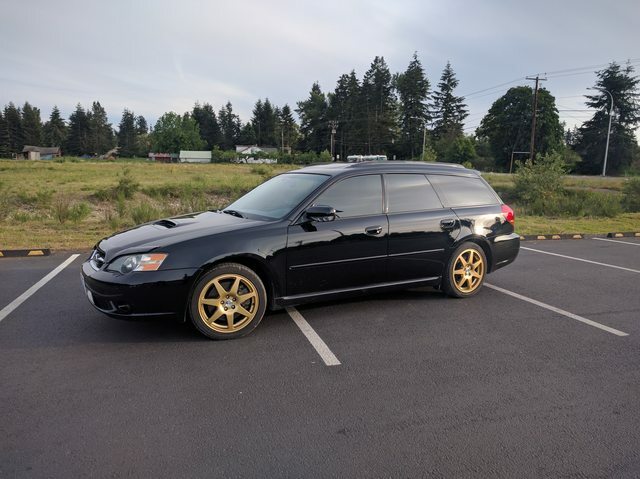 I got for free from a 2004 Impreza TS the rear sub frame and diff T.
Complete with lateral links front and rear all bushings and "Jesus bolt"
All i have to do is order the 4 body bolts and am golden. 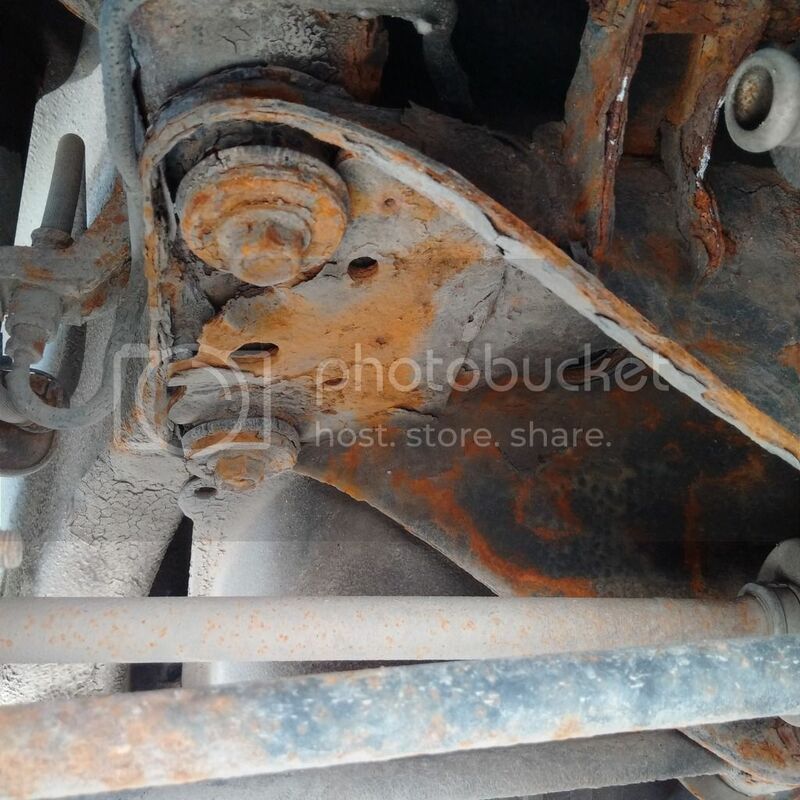 So from what i see on opposed forces i dont see why a impreza subframe from 04-05 would not work. And yes i know the 4 bolt hole into the body are different! The newer sub frame looks to have internal bushings vs. the legacy's have separate one. IF i can use the 2004 imrpeza TS rear sub frame here is my plan. Cut the each sides "Jesus bolts" off from the knuckle. Try hard not to snap the 4 bolts in the under body. Remove rear diff and diff T in one go with the sub frame. These blow ups show the Diff mounting and the differences. You can use the newer subframe with the internal bushings. I don't think that's a deal killer, however I can't comment whether all the mounting holes and everything else is going to be the same. Yeah any rear subframe for a rear strut car should be fine. So up to and including 07 Impreza. The only thing you might need to change are the studs in the diff if you change the mounting style. I would start by trying to break loose all the mounting bolts. That could be an issue- sometimes the weld nuts break off in the chassis. Although you could probably access those by drilling some holes in the floor of the trunk if needed. Try soaking in a penetrating lube and hitting things with a hammer to loosen it up. An inpact gun over a breaker bar can also help. Last edited by jamal on Tue Apr 25, 2017 6:18 pm, edited 1 time in total. Yeah, good points about penetrating oil. I'd suggest hitting them with PB Blaster for a good week or two and then try using an impact gun to break them loose. I agree with all of the above, but I recommend AeroKroil over PB Blaster. So i have replaced rear sub frames before on newer subaru's. I did manage to remove the 4 main frame to uni body bolts but with MUCH difficulty. I mean cans to PB blaster and a host of other things. Also im sure i have some modern rear diff studs. I have some diffs from some newer subi i can steal from. So that should not be an issue. Im going to FOR sure hit all bolts with penetrating oil and such weeks before i take the plunge! The car also needs more than just this also. I have a laundry list of things to do. If i do snap bolt or fastener.....Im not sure how screwed i will be. Im not one to condemn a car for rust and piles of work. I just dont want this job to end my poor car. You would just need to cut an access hole to get to the nut. Still dont want to have to slice into my trunk if need be. But TOTALLY will to fix it. Im going to start spraying up everything soon now and prep for this job. I have been able to replace the entire rear sub frame! All bolts that were bolted to the uni body came outwith any issues! What had happened was the 2 bushings on the bolt seized to the bolt. So you could not twist out the bolt. I ended up by spinning the bolt by hand round and round until the bushing rubber tore to bits. Then i just slipped off the front most lateral from the spindle bolt, then cut off the inner race of the bushing. THEN i could remove the spindle bolt! Once the old rear sub frame was on the floor next to my new on i could see how poor the old one was! The old one was concave and the bottom section of sub frame was nearly gone at the 4 top bolt holes. Concave as in the front to back of the sub frame was not level at all, like a skate board idea. All in all it worked out great! Spraying everything for a few months worked wonders! I would post pictures of the whole job but photo bucket is crap... And i need to find a new photo dumping place! To some it all up. Does not matter how beat up your car might be. You can fix it! With in reason of coarse! I'd love to see some pictures of the two subframes. Have you looked at using https://imgur.com ?